The County of Ventura is actively planning for sea level rise to protect coastal resources and to minimize impacts to residents, businesses, and visitors. The coastal zone in unincorporated Ventura County includes approximately 29 miles of coastline and is home to world class surf spots, including Rincon Point. Land uses along the County's coastline include public beaches, State park facilities, critical infrastructure such as bridges, State highways and coastal access routes, residential communities, agricultural fields, and one naval base. As such, coastal hazards associated with sea-level rise could result in significant impacts throughout the coastal zone. The VC Resilient Coastal Adaptation Project (VC Resilient) strives to use the best available science to understand critical vulnerabilities and then to develop a balanced and forward-thinking response to sea-level rise. Through an understanding of coastal hazards, we can begin to prepare for a future when sea level rise impacts are more severe. Generous grants from the California Coastal Commission and the California Coastal Conservancy, together with supplemental funding from the County of Ventura, have made this project possible. A GIS Story Map was also developed to interactively view the County’s sea level rise maps online and learn more about the VC Resilient Project. Click on the link below to view the GIS Story Map. Public Review Draft Sea Level Rise Adaptation Report Now Available! The first step in the VC Resilient Project is development of a Vulnerability Assessment. Click on the links below to read the Vulnerability Assessment. This assessment is an informational document that highlights potential impacts using three different sea level rise scenarios across the entire unincorporated County coastline. The Vulnerability Assessment includes analysis of sea level rise projections out to the year 2100. The best available science was used to complete the report with a range of projections, including those that we already face with high tides and storms. The Vulnerability Assessment can be accessed through the following links. Due to the large file size, the assessment has been broken into segments. The Vulnerability Assessment is a starting point for a common understanding of the risks, but it does not provide solutions. There are few easy solutions and most require additional funding and input from the public and from private landowners and resource agencies. This first step is a comprehensive look at what is exposed and how sensitive these assets are to sea level rise. The next step is to begin planning for adaptation. 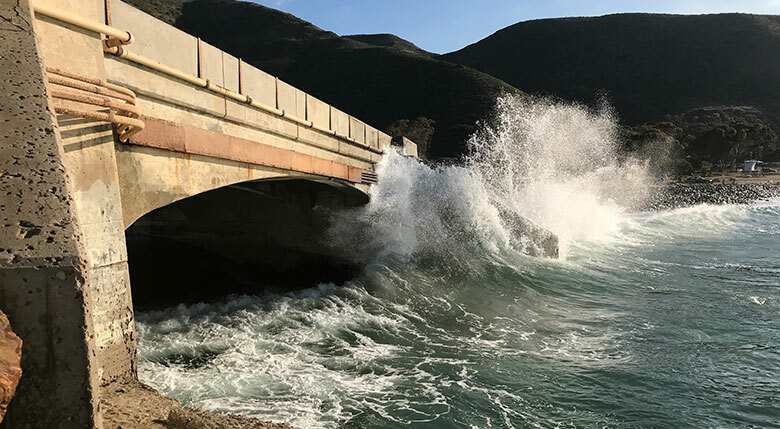 The goal is proactive, thoughtful adaptation planning that will allow Ventura County to minimize risks and meet the challenges posed by rising seas. Click here to subscribe to the VC Resilient stakeholder list. You will receive email notifications regarding this project and future public hearings. Please click on the links below to access the PowerPoint slideshows from public workshops for the Vulnerability Assessment that occurred on April 11, 2018.